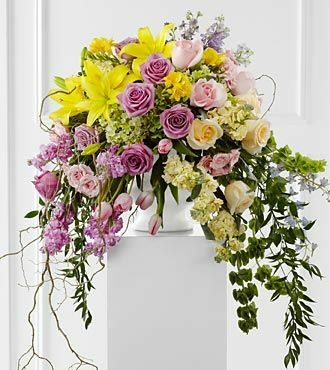 The FTD Display of Affection Arrangement is an exquisite way to commemorate the life of the deceased. Lavender roses, yellow stock, pink stock, pink tulips, yellow roses, pink roses, pink spray roses, lavender larkspur, Bells of Ireland, yellow freesia, yellow Asiatic lilies, blue delphinium, green hydrangea and lush greens are accented with curly willow branches and arranged to create a sophisticated display that radiates elegance and grace at their final farewell service. Approximately 40H x 26W.